It’s funny to think of small-scale, bio-intensive farming as a new, innovative way to grow food, when before agriculture became industrialized (more or less coinciding with the industrial revolution, 1760-1840), small-scale farming was the only way to farm--literally for thousands of years. In a nutshell, bio-intensive farming is an organic approach to agriculture that attempts to achieve high yields of produce while using a minimal amount of land space, and that seeks to preserve and improve the overall quality of soil. It's made possible with close crop spacing, the use of permanent vegetable beds, season-extension methods (a fancy spin of the word, "greenhouses"), and hand-tool usage. This kind of approach to farming keeps overhead costs to a minimum, increasing potential profitability and universal application. It's also the approach we take on our 1/2 acre garden plot at Global Outreach Developments Int'l. Yes, we only have a 1/2 acre garden. 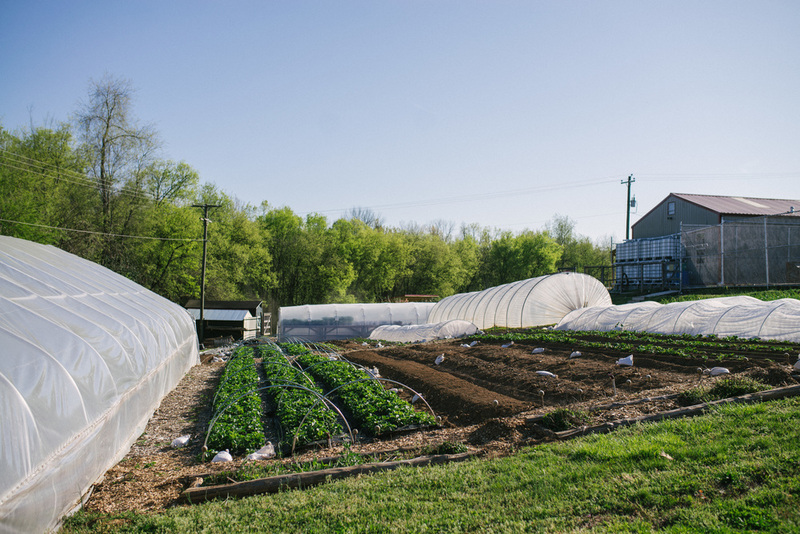 And yes, we produce nearly 10,000 pounds of produce on it each year. Conventional Western farming, or Mechanized farming, on the other hand, takes the route of growing crops in vast fields with the use of large machinery. It is limited according to the spacing necessary for large tractors to maneuver through rows of crops. It's also dependent on very large budgets, using substantial amounts of fossil fuels, owning a lot of land, and most often the use of chemical fertilizers and pesticides. The equipment we use in the G.O.D. Int’l garden is comprised entirely of hand-tools, many of them being recent innovations, but still replicable, if not accessible, world-wide. This is essential to our approach in development work, which emphasizes the use of appropriate technology--tools that are reasonably accessible within a given regional context. 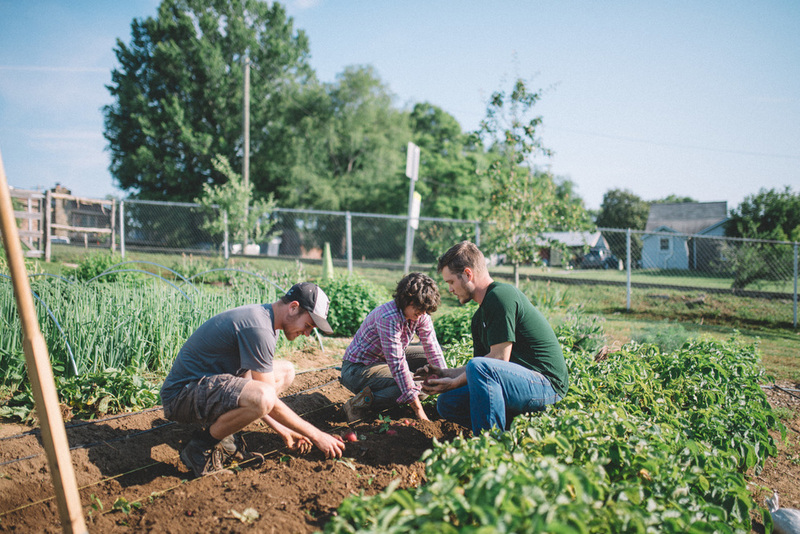 The following are a few of our most important tools that make our garden go 'round. 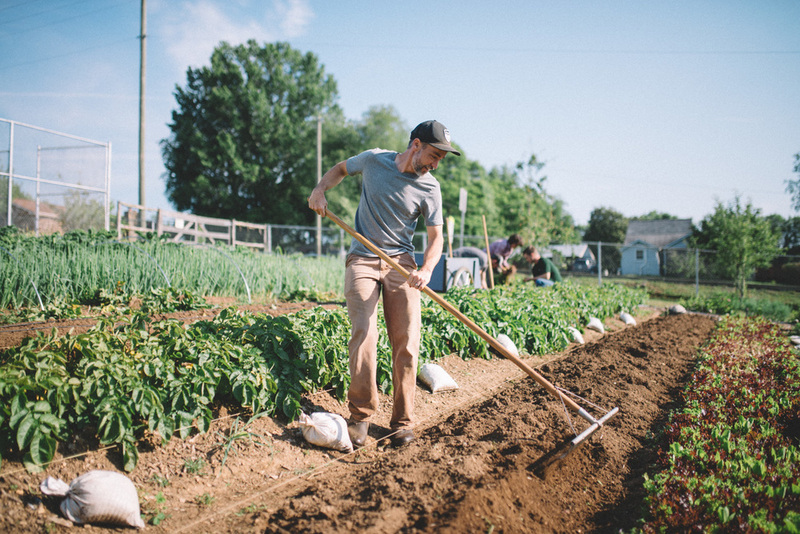 The Broad Fork--one of the simplest, most economical, and most essential tools utilized in the garden--is a wide, U-shaped digging fork used to loosen soil without inverting or mixing it. It’s ergonomically designed so that the user stands straight up and uses their body weight for leverage, thus easing the pain felt from a long day of manual labor. If you were only able to afford a handful of tools for your garden, this one would definitely be at the top of the list. Most of the vegetables in our garden begin in a greenhouse nursery and are then transplanted into a bed when mature. Transplanting, rather than direct seeding, allows for more control in the germination process and in weed control, thereby increasing the success rate in vegetable growth. There are various methods of seeding for a nursery, but our preferred method for the job is the soil-blocking, in which a press is used to (you guessed it) create small blocks of soil that are seeded and eventually transplanted when the plant is ready. For the plants that we directly seed into garden beds rather than transplant, we use precision seeders. Despite the disadvantages of direct seeding, it’s way faster and more efficient for certain crops (e.g. lettuces, mixed greens, spinach, and carrots). The six-row seeder, for example, is loaded with seeds and then pushed on it’s two rollers along the length of a bed, dispersing seeds at the exact, adjustable spacing desired for intensive growth. The tilther is a lightweight, drill-powered tiller that mixes only the top two inches of soil to cut through roots of previous crops or make the perfect soil consistency for direct seeding. The seedbed roller is used as the last step in preparing a bed for seeds. It uses the weight of any block to flatten the surface of beds, leaving miniature furrow indentations that resist erosion from wind and rain, thus improving germination rates. Although from the name of it you might infer that it could be a device used at rodeos, the stirrup hoe’s most effective use is weed management. It’s a long-handled hoe with a double-sided blade used for cutting through weeds just below the soil surface, making the entire process of weed management way less time consuming. Why put forth all of this effort? Because we farm with an international context in mind. While less than 1% of the U.S. population is involved in farming, when we go abroad, farming is the standard occupation. According to the World Bank, agriculture is the main source of income and employment for 70 percent of the world's poor who live in rural areas. Our garden serves as a tutor not only for ecologically responsible, high-yielding agricultural methods, but more importantly as means of empowerment for any struggling farmer, anywhere.